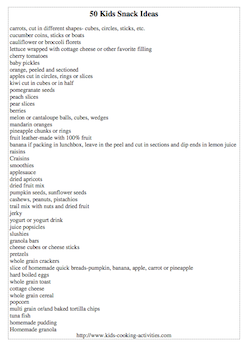 Here is a compiled list of snack ideas. To be considered healthy make sure you pay attention to portion size. Read the labels of packaged food. Don't buy items with high sugar high sodium content. Sometimes changing the shape or look of food helps kids be more interested in eating a healthy snack. Sometimes I core an apple and cut it into rings instead of slices or instead of round carrot circles I'll cut them in sticks or leave whole and I'm amazed how much they enjoy this little change. Don't forget to print the list of snack ideas below. carrots, cut in different shapes- cubes, circles, sticks, etc. 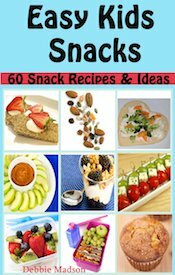 Would you like a printable list of these healthy snack ideas? Do you have an easy snack for kids idea?